Plan Tab – This page is where Family Treemaker opens up on. 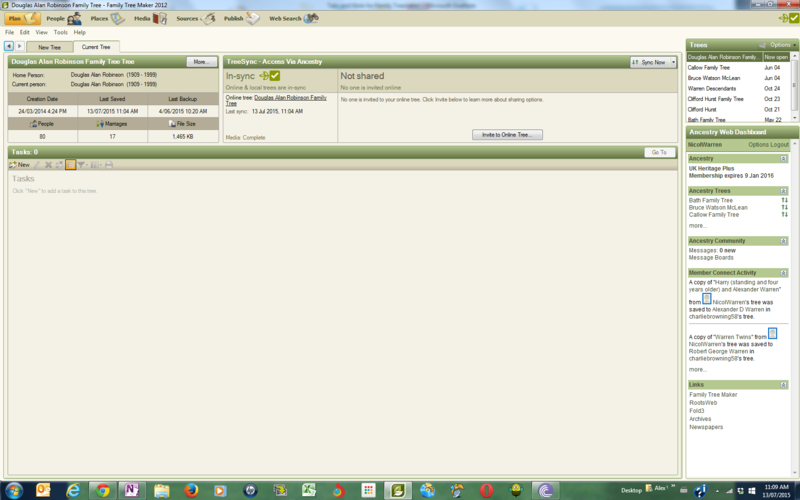 It shows me when I have synced and saved my trees from Ancestry.com website last. The main area can be used as a to do list for my research that I can consult to keep me on track. Down on the right side is your dashboard. It lets me know when my membership for Ancestry needs to be renewed. You can see any message from the community boards and you can see member connect activity. This lets you see who is copying what off your trees, so then you can look at their trees to find links. The links at the bottom are not that good as they are US based and lead you to subscription websites. 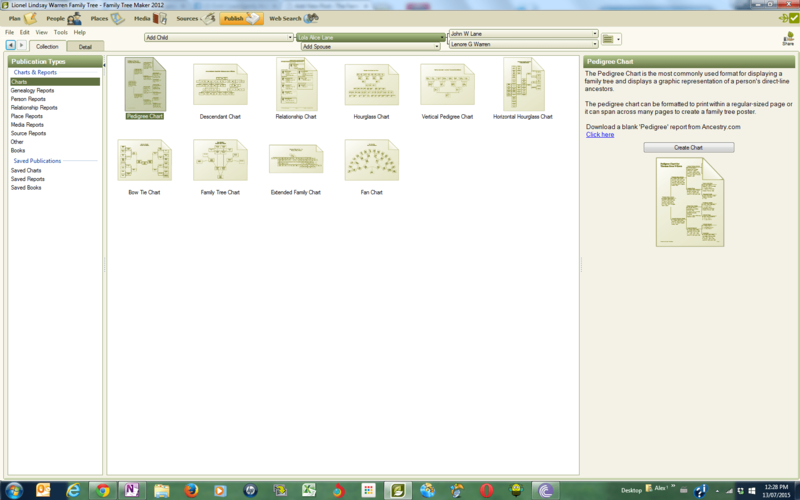 All my trees are in the left hand tab at the top and if I click on them I can easily change over to look at them. People Tab – Being able to see all the information for a particular person is very handy. However I generally use the pedigree format in this tab. Very easy to add other family members with tabs to add spouse and children available on most pages. Also adding media can be easy by clicking on the media tab in this page and adding photos directly to that person that you are on. In the top left corner is advanced nodes, ticking that will give you a small picture (if you have attached on) and the years of birth and death. The 2014 version, has the use of Smart Stories where Family Tree maker will make a story from the facts and media images that you put in a profile for a person. Also in the 2014 version, family view supposedly includes all extended family members like on the ancestry website. This would be great as I find myself backtracking and taking a bit of time trying to look at siblings and I get caught on a screen where all I can see is my current person with their children, spouse and parents. 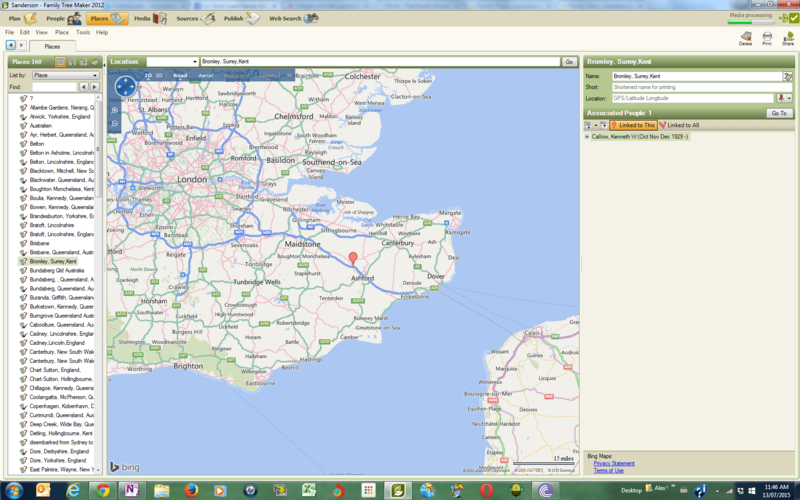 Places Tab – One of the first things I do when I find where people live is look at a map and google the town. Having an idea of places in the area can help you narrow down your options. You may have two people with the same name dying in the same year but different places, checking out a map of the area your ancestor lived in can narrow it down. It can also help when looking in newspapers at events and articles of your ancestors as you can look for that town’s newspaper publications. Family tree maker gives you the ability to pinpoint the town or area of your ancestor so you can look for more clues. They are using Bing for the mapping feature. However down the left hand side is a list of places that you have put in. My main problem is the messiness with the place names. The list is so long but to standardise the information seems like such a long and laborious task. I am also a bit worried about changing anything as I’m not sure if there is a reason why I have put in a name in that format eg name of a church in the title for a baptism. For me I like to try to add in the place name right at the beginning and then not muck around with it after that, because if I’m not looking at the source then I can’t make the call. The birds eye view is very interesting as I like looking at the buildings in the area. However, the idea of having a line of migration is a bit lost on me. 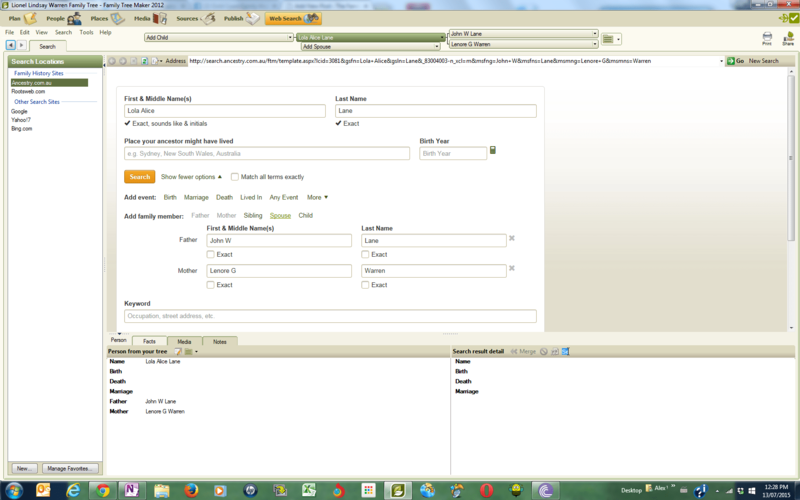 Media Tab – I print the screen when I get an electoral roll entry on Ancestry.com or other such information. 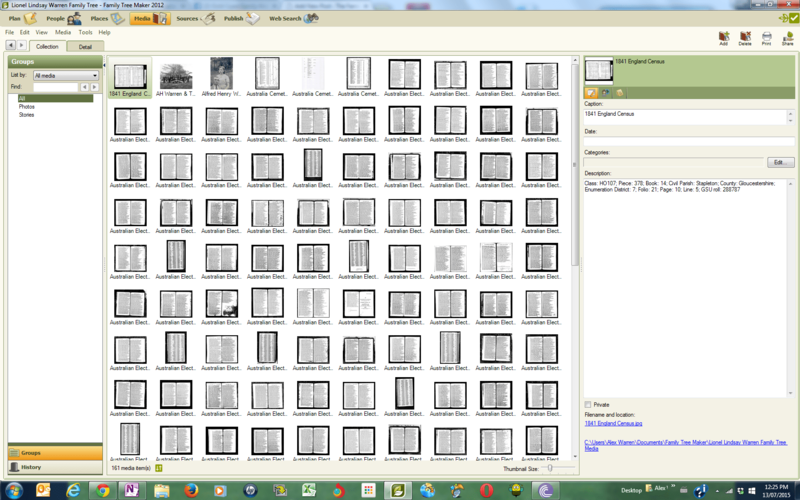 So when doing a history of a family member I am always checking that I saved those screens to the person. So it is good to know that the whole page of electoral roll or parish book is safe also in my Family Tree Maker. All there with the reference of where it has been sourced from. I can also link it to different people easily. Family Tree maker also gives you the ability to link to a file in your hard drive instead of copying it, this means that large files don’t take up extra space but existing twice on your computer. Sources – Sources tab is very good to keep track of where you got your information from. It syncs to Ancestry and the source of your information automatically is being saved into this area. 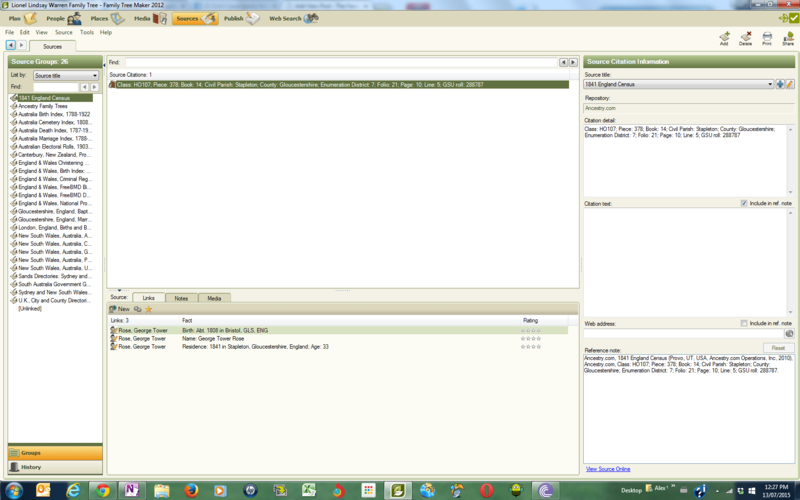 I like that there is a template for entering my sources so I know I won’t forget to put in all the details. Publish Tab – I like to use this tab for printing out a pedigree chart. Before Family Treemaker I used to use word and put in my text boxes everywhere and take ages to get it all set. Now it takes me only a few minutes. I also like the family relationships report to keep track of the different family branches. 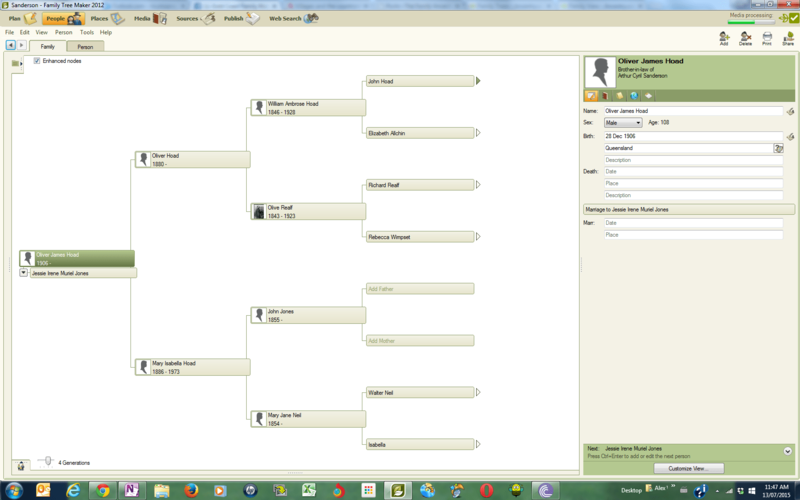 I also like mucking around with adding images to my pedigree chart to make it a bit more interesting for my family. Family Treemaker has a Book tab in this area however the book tab really isn’t much as it has the same functionality as making up my own word document and printing it to a PDF. Websearch Tab – I like that Family Tree maker offers to help me do a websearch but I feel like I am missing out a bit on only having a basic word search format available. It does make it easier to search with the words and dates already pre populated. The information collection ability is quite good as it helps you take the information directly from the internet resources. Tools Bar – The tools bar has a date calculator where you can enter in information that you know to work out an approximate birth year or if you know their birth year you can work out their age at an event/year in their life. The relationship calculator lets you put in two peoples names and then it works out what relation that they are to each other. The Soundex calculator gives you a value that you can add in when working with American information like their census. It can find surnames that may be related with the use of that value the calculator has worked out. Privacy – Ability to make things private if you want is always there in Family Treemaker. If you keep your information only in Family Treemaker and don’t share it with others or connect it to the internet it will always be private. However if you want to upload to Ancestry.com website, you are asked who you want to be able to see your information. You can make your tree public or private tree and you can even exclude it from searches, so no-one would ever find it. Also if you have living people in your tree then their information can’t be accessed when it’s on Ancestry.com. Ancestry automatically picks that up if you have listed the person as living when you entered them. Media items that can be added on a person can be made private also. Duplicates – In the edit menu, you can find duplicate people. The ability to find duplicates in Family Treemaker and compare them side by side is great. The Ancestry.com takes a bit of fiddling to delete if you have added them incorrectly, so it’s far easier to get Family Treemaker to work it out for you. Family Treemaker is great to have if you are beginning in your genealogy and family history research. Having software to keep you organised from the start is a great benefit. I like not having to be connected to the internet constantly and I like knowing that even if the internet goes down I can still look things up. I also quite regularly will print out my pedigree and family charts when I’m going out to do more research. There are many different programs out there that will have different benefits, it’s really up to you what you prefer. Last updated by Nicol Warren at August 5, 2015 .